The Holy Roman Empire should not be mistaken for the Roman Empire. The Holy Roman Empire (German: Heiliges Römisches Reich, or in the 15th century: Heiliges Römisches Reich Deutscher Nation) was a group of regions and free cities in central Europe which all came under the rule of an emperor who was elected by the princes and magistrates of the regions and cities within the empire. When Charlemagne died, his Frankish Empire was given to his children and divided into three different countries: West Francia, Lotharingia and East Francia. The Holy Empire started when Otto I of East Francia became Holy Emperor in 962, and it was ended by Napoleon in 1806. The emperors claimed to be heirs of Charlemagne and that the Empire dates from 800, when Charlemagne became Frankish Emperor. In the 16th century the Holy Roman Empire (HRE) had to deal with the rebellion of the Frisians lead by Pier Gerlofs Donia and Wijerd Jelckama. This lasted from 1515 until 1523. In the 17th century the Empire was shattered by the Thirty Years' War (1618-1648). Nearly thirty percent of the population of the Empire was killed. 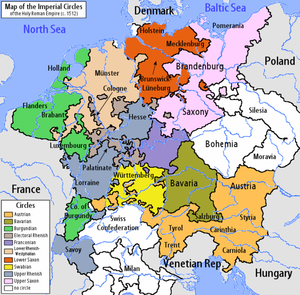 The Holy Roman Empire of the German Nation lost parts of its territory. Until the 13th century, the Holy Roman Empire was powerful. Later, all the duchies and counties inside the Empire started to get more power. At the end, the Emperors did not have a lot of real power any more, and the country existed only in name. Voltaire, a French philosopher in the 18th century, once joked that the nation was neither holy, nor Roman, nor an empire. This page was last changed on 19 March 2014, at 00:22.